It’s finally here—SIHH 2018 kicks off the new year for the luxury watch world with some of the best fine timepiece brands releasing their novelties. 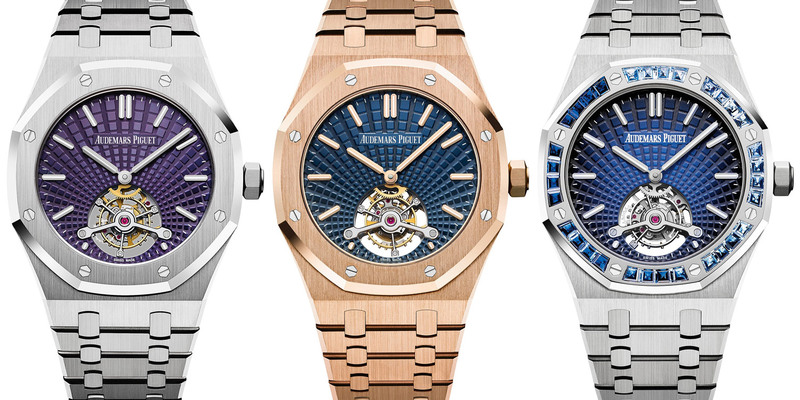 While Audemars Piguet introduced a slew of new Royal Oak models, today we hand-picked four of our favorites. Following their Royal Oak Concept Acoustic Research timepiece from 2014, Audemars Piguet now adds another model to their Research & Development lineup. The Audemars Piguet Royal Oak RD#2 Perpetual Calendar Ultra-Thin is in fact now the thinnest automatic perpetual calendar in the world—and that’s a big deal. Taking five years to develop, the RD#2 Perpetual Calendar Ultra-Thin measures a mere 6.30mm thick despite the complex in-house Caliber 5133 movement inside, which measures just 2.89 mm thick. The diameter of the familiar Royal Oak case shape measures 41mm and is crafted entirely in platinum. 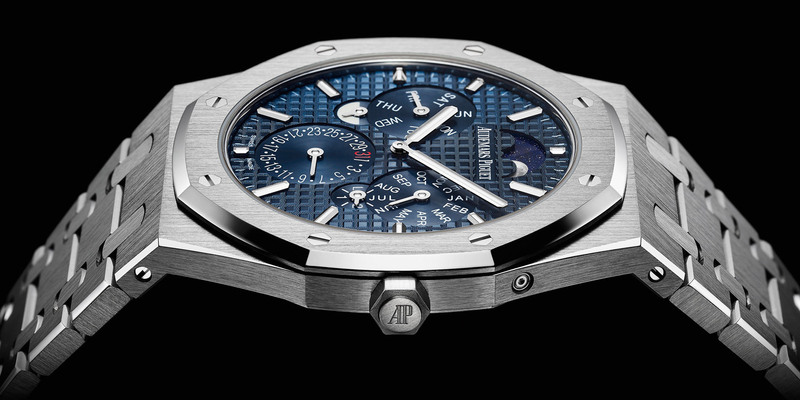 Plus, the equally famous Royal Oak integrated bracelet is also in platinum, offering some notable weight on the wrist despite the watch’s record-breaking thinness. Here we have the big brother of the Royal Oak, the Offshore. New for this year, Audemars Piguet offers the Royal Oak Offshore in black and white ceramic and as its “Grand Complication” label implies, plenty of watch functions. The Audemars Piguet Royal Oak Offshore Grande Complication measures a hefty 44mm in diameter and the ceramic case includes titanium pushers. The rubber strap emphasizes the watch’s sportiness while the minute repeater, perpetual calendar, and split-seconds chronograph functions remind us that AP is indeed an haute horology manufacture. These types of complications are typically found in dressier more formal watches, but Audemars Piguet does have a habit of “breaking the rules”. The open-worked dial gives us a glance of in-house Caliber 2855 automatic movement, as does the transparent sapphire exhibition caseback. With these new models, Audemars Piguet has revamped their famous “Tapisserie” dial pattern to now stream out from the tourbillon mechanism that sits at 6 o’clock rather than its traditional symmetrical layout. That layout certainly brings the eye directly to the oscillating tourbillon—not that it needs it; the tourbillion is perfectly capable of capturing all the attention on its own. Regardless, the fresh dial configuration is a welcome addition to the Royal Oak collection, particularly in the trio of vibrant hues. Wearers can choose from blue, smoked blue, and plum. These new dials are encased within a 41mm octagonal RO case in stainless steel, pink gold, or platinum. The platinum version is further decorated with blue sapphires on the eight-sided bezel, sitting alongside the characteristic exposed screws. Powering the new Audemars Piguet Royal Oak Tourbillon Extra-Thin timepieces is the Caliber 2924, which can be admired via the transparent caseback. We end with a new iteration of an oldie but a goodie. 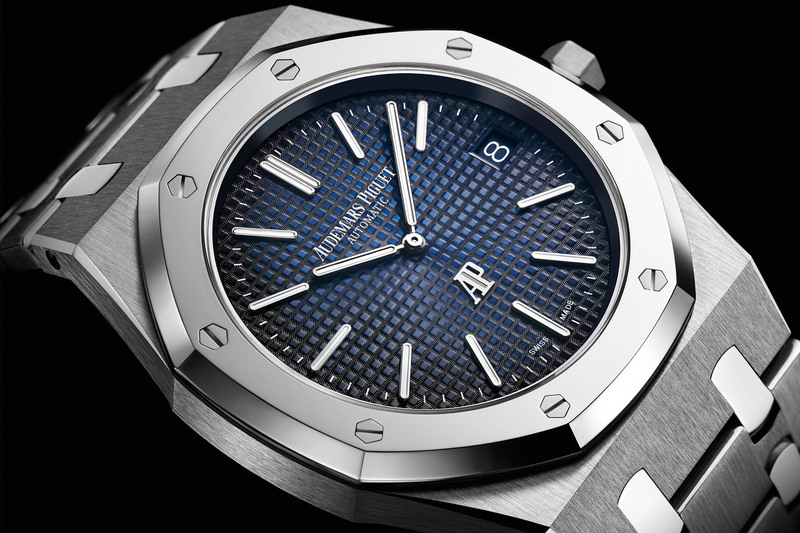 Based on the original 1972 Royal Oak, the new Audemars Piguet Royal Oak Jumbo Extra-Thin is now available in a mix of titanium and platinum. Using ultra-light titanium for the case and mixing it with heavy precious platinum for the bezel, the new Royal Oak Jumbo Extra-Thin maintains the 39mm case diameter. Within the case lies the smoked blue “Petite Tapisserie” dial with center hour and minute hands in addition to a date window at 3 o’clock. The watch runs on the Caliber 2121 with a 40-hour power reserve. Finally, finishing off the timepiece is the titanium bracelet with platinum links. 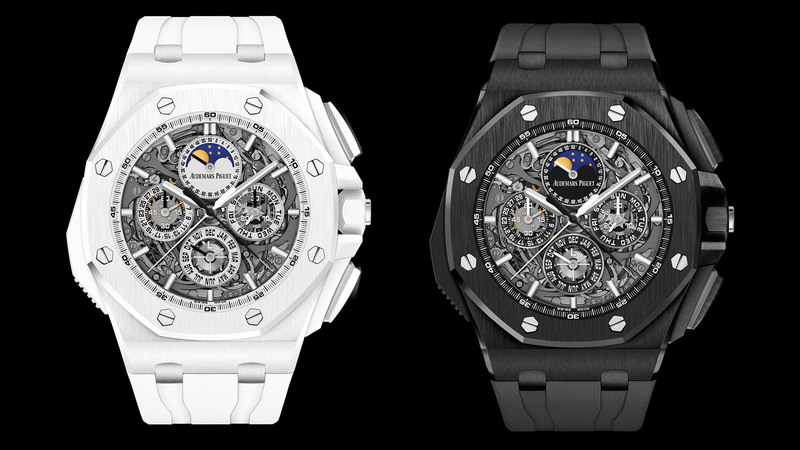 What do you think of these four new releases from Audemars Piguet? Leave us your thoughts in the comment section below. Stay tuned for upcoming articles on releases from other brands showing at SIHH 2018.